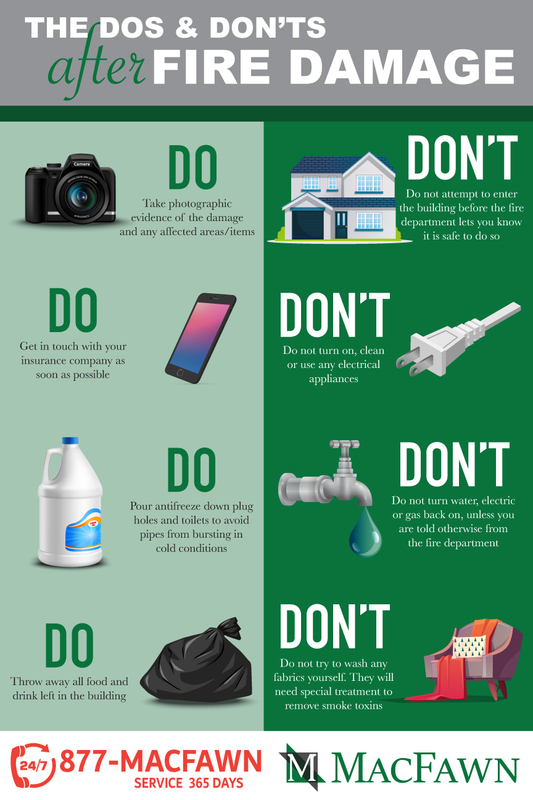 The Dos & Don'ts After Fire Damage - MacFawn Enterprises, Inc. When you have a fire happen in your home or office take some time to document and stay safe. DO take precautions and always try to keep yourself safe. If you are unsure about something and find yourself not knowing what to do, you are better off waiting for a qualified professional. You are ALWAYS better off safe than sorry. DO take pictures of the damage. You will need to prove to your insurance company that anything damaged was actually damaged in the fire, so take pictures of everything you can to make that step easier. DO stay organized. This can be difficult amidst your scorched surroundings but if you do, it will make this process smoother and more efficient. DO take notes. Start blotting down every conversation or online correspondence that you have with your insurance agent or restoration professionals. In a stressful situation, miscommunication can happen so it will only be to your benefit to keep track and prevent that from happening. DO save receipts and original documents. This will be to your benefit when it comes to your insurance claim. DO make your first call to your insurance agent. Not only is it required that you file your claim as soon as possible, it is also in your best interest. At this time, you’ll be asked to submit a proof of loss claim. The sooner you get the ball rolling, the sooner an insurance adjuster will arrive at your door to begin assessing the damage. DO have a qualified and restoration company be next on your call list. These guys have been trained to cleanup and repair after a fire damage and ultimately will help make this process as easy on you as they can. They will work with your insurance company to initiate a fire damage recovery plan that includes the complete restoration of your structure. DON’T wipe or attempt to wash fire residue from walls, ceilings, or other absorbent surfaces. It is important not to tamper with any of the damage before it has been assessed by your insurance agent. DON’T use carpeting or upholstered furniture impacted by heavy smoke residues or debris until they have been safely cleaned. They will need special treatment to remove harmful smoke toxins. DON’T use food items or canned goods that were exposed to the heat of the fire. Throw all food items out immediately. DON’T turn on computers, televisions, stereos or electrical appliances until they have been professionally cleaned and checked. The fire could have damaged the electrical circuits which may be hazardous.